“Plant-in City” Art Installation Uses Stackable Terrariums To Create a Lush Urban Environment | "Global Possibilities"
The designers at Med44 are developing a neat project that will blend architecture, technology and plants into one fantastic art installation. 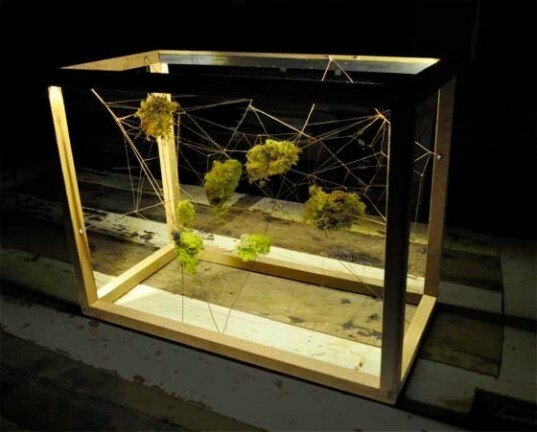 Plant-in-City will be an immersive environment comprised of stackable terrariums inside a gallery space in Manhattan. The group is planning to use a combination of plants and technology, complete with built-in sensors activated by the sun, changes in soil moisture, and humidity, that translate the surrounding environment into a brilliant audio and visual landscape. Here’s the technical bit: the team say they will incorporate “a system of stacked or interconnected planter frames equipped with an embedded microcomputer (Arduino) and a series of sensors that detect changes” in the environment. And to make the space an interactive showroom, they have brought in iPhone technology to power the Plant-in City. Currently pushing their target funding amount on kickstarter, the designers are en route to creating what they hope will become a dense, leafy space in the center of the concrete jungle. Take a look here for some more information.